I designed this display in front of my classroom to set up a theme for getting my kids involved. I decorated the entire wall outside of my classroom to resemble, in my mind, what 'Ms. Frizzle's Magic School Bus' would look like. I changed the idea to Ms. Jonizzle's (My name is Ms. Jones.) 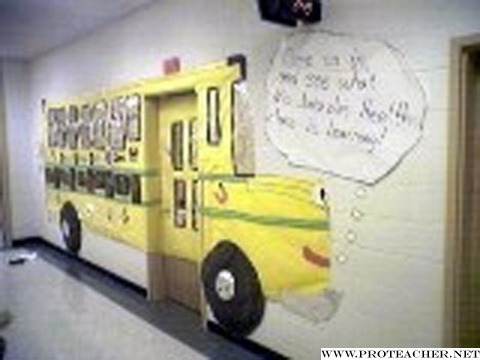 Magic School Bus, and since Ms. Frizzle was well known for teaching science, I did a bus for health. I used several of her books throughout my theme to introduce my lessons and bring excitement about my pretend sister. I also had a 'Liz' stuffed animal that I called 'Diz', and I carried it around everywhere I went. I dressed up to help the kids use their imagination, as well. 'Ms. Jonizzle's Magic Bus' was a three dimensional creation. The wheels came out of the wall, and the windows were all made of aluminum foil. I included several different culminating activities during the theme. On the bus was pasta-made skeletons, and then later, I added a writing assessment that told what they had learned and what they enjoyed the most. We also did lots of different hands-on experiments and used the internet to look at different things about the skeleton. It was great and a year later, my fellow colleagues are still talking about it.